Games are not the only things you can make with realtime 3D technology. And modification of commercial games is not the only option accessible to artists. Realtime 3D is the most remarkable new creative technology since oil on canvas. It is much too important to remain in the hands of toy makers and propaganda machines. the most stunning art to grace this planet so far. Real-time 3d interactives can be an art form unto themselves. Do not hide behind the freedom of the user in an interactive environment to ignore your responsibility as a creator. This only ends in confirming cliches. Do not design in board room meetings or give marketeers creative power. Your work needs to come from a singular vision and be driven by a personal passion. Do not delegate direction jobs. But collaborate with artisans more skilled than you. Ignore the critics and the fanboys. Make work for your audience instead. Embrace the ambiguity that the realtime medium excells in. but keep the user focused and immersed the worlds that you create. Commercial games are conservative, both in design as in mentality. They eschew authorship, pretending to offer the player a neutral vessel to take him or her through the virtual world. But the refusal to author results in a mimicing of generally accepted notions, of television and other mass media. but the overall product is not art. Step one: drop the requirement of making a game. The game structure of rules and competition stands in the way of expressiveness. Interactivity wants to be free. Gaming stands in the way of playing. There are so many other ways of interacting in virtual environments. We have only just begun to discover the possibilities. They are ancient forms of play that have their place in our societies. But they are by far not the only things one can do with realtime technologies. All elements serve the realisation of the piece as a whole. Do not rely on static renderings. Everything happens in real time. The visuals as well as the logic. Simulate sensorial sensations for which output hardware does not exist (yet). (it does not need to look real). Do not imitate other media but develop an aesthetic style that is unique. Make the activity that the user spends most time doing the most interesting one in the game. It’s not about the individual elements but about the total effect of the environment. and not by its individual elements. Models, textures, sound, interaction design, environment design, atmosphere, drama, story, programming. No element can be singled out. All are equally important. Create a simulated multi-sensorial experience. Not only a picture. but takes the body into the experience. but also through the narrative content. Interaction is the link between the user and the piece. to connect the user to the environment. Make the user feel at home. The user is the center of the experience. to “put the user in the environment”. to visit a place that would otherwise not be accessible. or at least your memories of it. Strictly speaking, our output media only allow for the reproduction of visuals and sound . But real-time interaction and processing can help us to achieve simulation of touch, smell and taste as well, through visuals and sound. In fact, force feedback already provides for a way to communicate with touch. And the activity of fingers on the mouse or hands holding a joystick allows for physical communication. From the USB port to the joystick. Through the hand to the nerous system. Soon as smell and taste can be reproduced, those media can quickly be incorporated into our technology. The virtual place is not necessarily alien. It can deal with any subject. create links between the environment and the user. Since interaction is pivotal, these links are crucial. Make it feel real, not necessarily look real. Imitate life and not photography, or drawings, or comic strips or even old-school games. Realism does not equal photo -realism! It has to feel real. and connect them with each other. Stories are a vital element of society. Let go of the idea of plot. Tell the story through interaction. Do not use in-game movies or other non-realtime devices to tell the story. Do not create a “drama manager”: let go of plot! Plot is not compatible with realtime. The ancient Greek philosopher Aristotle recognized six elements in Drama. the visual elements of the work. All of these can be useful in non-linear realtime experiences. Except plot. But the realtime medium offers additional elements that easily augment or replace plot. These new elements add the viewer as an active participant to the experience. This is not a reduction of the idea of story but an enrichment. Realtime media allow us to tell stories that could not be told before. Many of the mythical fantasies about art can now be made real. Now we can step into paintings and become part of them. Now sculptures can come alive and talk to us. Now we walk onto the stage and take part in the action. We can live the lives of romance characters. Do not reject stortelling in realtime because it is not straightforward. Realtime media allow us to make ambiguity and imagination active parts of the experience. The realtime medium allows for telling stories that cannot be told in any other language. Realtime is a poetic technology. Populate the virtual world with narrative elements that allow the player to make up his or her own story. Imagination moves the story into the user’s mind. It allows the story to penetrate the surface and take its place amongst the user’s thoughts & memories. The bulk of your story should be told in realtime, through interaction. Do not use in-game movies or other devices. Do not squeeze the realtime medium into a linear frame. Stories in games are not impossible or irrelevant, even if “all that matters is gameplay”. Humans need stories and will find stories in everything. if you extend gameplay to mean all interaction in the game. Because it is through this interaction that the realtime medium will tell its stories. The situation is the story. so that the situation immediately triggers narrative associations in the mind of the user. The rule-based structure and competitive elements in traditional game design stand in the way of expressiveness. (playfulness is required for an artistic experience!). 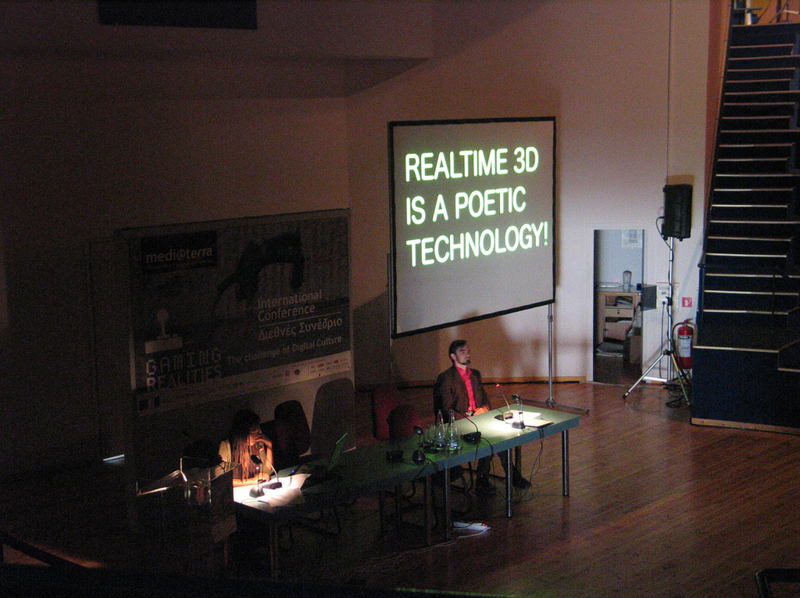 Interactivity is the one unique element of the realtime medium. The one thing that no other medium can do better. It should be at the center of your creation. the thing you do most in the game, should be the thing that is most interesting to do. i.e., If it takes a long time to walk between puzzles, the walk should be more interesting than the puzzles. Furthermore contemporary art is a marginal niche. Go to them rather then expecting them to come to the museum. Contemporary art is a style, a genre, a format. -ironical, cynical, afraid of beauty, afraid of meaning. It abuses a technology that has already spawned an art form capable of communicating far beyond the reach of modern art. Made by artists far superior in artistry and skills. Game art is slave art. Realtime media are craving your input, your visions. Real people are starving for meaningful experiences. Contemporary civilisations are declining at an unsurpassed rate. The world is collapsing while the Artists twiddle their thumbs in the museums. Into the private worlds of individuals. and not to read about. Use the language of your medium to communicate all there is to know. The user should never be required to read a description or a manual. Don’t parody things that are better than you. Parodies of commercial games are ridiculous if their technology, craft and artistry do not match up with the original. Don’t settle yourself in the position of the underdog: surpass them! Show them how it’s done! Put the artistry back in Art. Make art for people, not for documentation. Make art to experience and not art to read about. Use the language of your work to communicate its content. The audience should never be required to read the description. The work should communicate all that is required to understand it. and least of all, don’t make art about this fear. Technology is not nature. Technology is not god. Made for people by people. Software is infinitely reproducable and easy to distribute. Reject the notion of scarcity. Embrace the abundance that the digital allows for. The uniqueness of realtime is in the experience. Cut out the middle man: deliver your productions directly to the users. Do not depend on galleries, museums, festivals or publishers. it should be about life, death and the human condition. Embrace technology, make it yours! Use machines to make art for humans, not vice versa. Don’t worry about the polish too much. Get the big picture right. Sell your work directly to your audience. And use alternative distribution methods that do not require enormous sales figures to break even. Consider self-publishing and digital distribution. Avoid retail and traditional games publishers. that it requires you to sell hundreds of thousands of copies to make your production investment back. Do not allow institutional or economic control of your intellectual property, ideas, technology and inventions . Don’t depend on government support or the arts world exclusively. Realtime Art Manifesto presentation slides.